Straw bale gardening gets a lot of press—and for a good reason. The technique allows you to put a substantial but temporary garden almost anywhere, even if your yard's sunniest spot happens to be the middle of your driveway. They're a raised container garden inside a biodegradable container. Sounds great, right? Could be. Check out the technique's pros and cons to help you decide if you want to set up a straw bale garden. Easy on Your Back: Straw bale gardening is one of the easiest and least physically taxing kinds of gardening. After you get your straw bales in place, you don’t even have to bend down to the ground pick your veggies or pull out any weeds. Garden Anywhere: You can put a straw bale garden anywhere sunny. That said, it's not a good idea to put bales on any wood you care about, such as a deck, because their constant dampness could cause it to rot. But you can garden in a driveway, empty lot, or rooftop, provided the roof can handle the weight. The bales hold a lot of water and get heavy. Economical: You can get straw bales at nurseries, feed stores, or even from some farms for less than $10 per bale, maybe even less than $5, depending on the size, whom you buy from, and the going price where you live. They Work: You can have huge success with growing vegetables in straw bales. Although you have to stay on top of watering, compared to other container gardens, the bales do retain water pretty well. Because the straw bales decompose over the season, it's not a crisp and neat way to garden, even at the outset, so most of the cons are about the garden's look. Weeds: Even if you use straw bales—not hay bales, unless you suffocate the weeds before you plant your garden—your bales will sprout and if left alone will start looking like giant Chia Pets. The good news is that the sprouts are easy to pull out or to trim with scissors. You may even have mushrooms and fungus growing in your bales. They are usually either easy to get rid of or you can ignore them, as most won't harm your plants. End-of-Season Funk: By the end of the growing season, a straw bale garden can look ragged. As the bales compost, they get a little saggy and untidy. 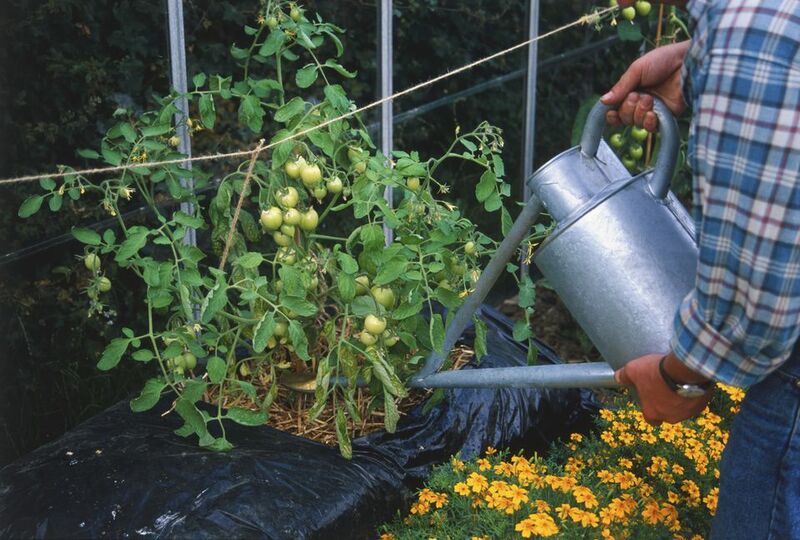 Stability: If you have tall plants in them, such as large tomatoes, sometimes the bales can't hold up the plants' weight and start to tip over. You can add extra staking, grow shorter varieties of tomatoes, or just let them sprawl. Bales are Heavy: Straw bales are heavy, especially when wet. If you’re not very strong or have an injury, you may need some help setting up your straw bale garden.